In my nine years of motherhood, I’ve done several things to generate an extra income. I’ve worked temporary jobs. I’ve filled in for various small business owners around town when they needed a few days off. I’ve had part time jobs, full time jobs, babysitting gigs, and jobs at my husband’s office. On top of that work experience, I’ve just spent 12 out of the past 14 months as a 100% stay-at-home mom. Basically, I’ve been through so many different work experiences and situations that I’ve learned the good, the bad, the ugly, and the awesome about each situation. Being a working mom is busy. 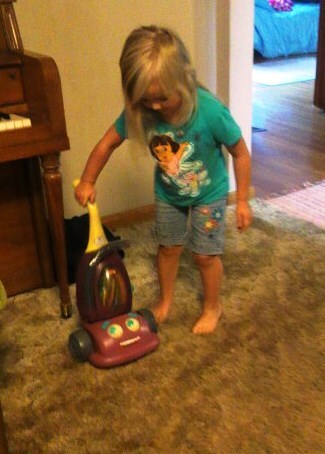 Being a stay-at-home mom is busy, too! One thing I really loved when I worked was that if the house was clean when we left in the mornings, it actually stayed clean all day. When I stay home, messes are made all day long. On the flip-side, I do have more time to clean, fold laundry, cook from scratch, and complete extra projects when I stay home. As someone who used to really struggle with time management, working outside the home forced me to become more efficient with my time. Gone were the days of taking all day to clean the house – I had to learn to keep everything “good enough” in a much shorter amount of time. This is a good thing! As a stay-at-home mom, I can now keep a clean-enough house, write, and spend plenty of time with my children among other things because of the time-management skills I learned while I was working outside the home. Yes, working outside the home helps financially. But not always as much as you might think. Without the cost of work lunches, an office wardrobe, childcare, and extra outside help, my family saves a ton by me staying home. Plus, the small income that I generate with my book business doesn’t hurt, either! When I worked, we took more trips. 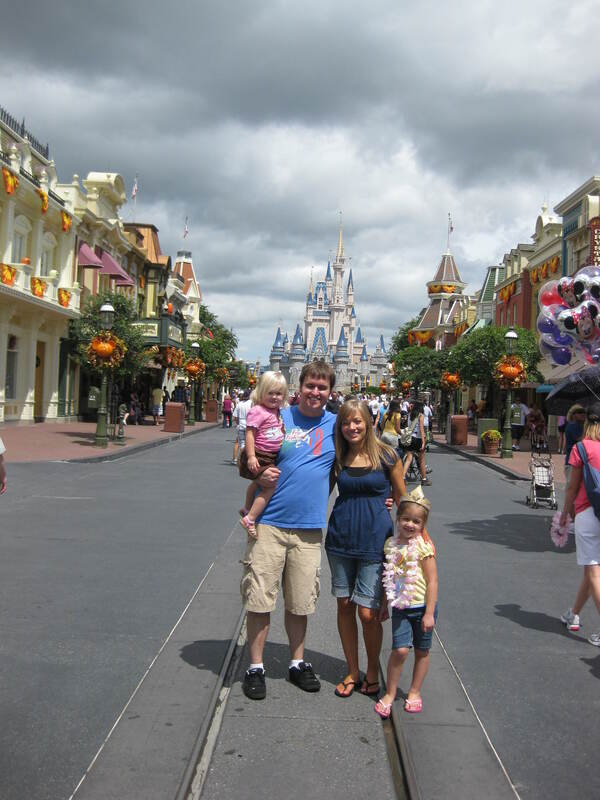 Not only did we have a little more leeway in our budget, but we were so much busier in general that we needed to get away to be able to reconnect and relax as a family. Now that I stay home, we can all relax and enjoy the evening as a family after Nathan gets home from work because I’m able to take care of the basic necessities during the day. We still enjoy traveling together but it’s much less frequent and much more frugal than before. One thing I really liked about working outside the home was grown-up time on the days I didn’t have my kids with me at the office. Lunch breaks weren’t spent cleaning up spills or sticky faces. Computer work wasn’t interrupted every two minutes with a child needing something. When I stay home full time, I’m (obviously) with my kids. All. The. Time. This means that sometimes I feel like I’m going to lose my mind, but it also means that I never have to miss out on their lives. Every scrape, every tear, every sticky face… they’re all wiped clean by me. And every laugh, every toothless grin, every new skill that’s learned… I’m there for those too. As a stay-at-home homeschool mom, I rarely have to worry about bullies, a care-giver not taking proper care of my children, or other negative influences because I get to choose who my children are with. This is huge for me. There are working moms who maximize every minute they have with their kids and they do a great job. Many stay-at-home moms do that as well! There are also, unfortunately, working moms who spend their evenings and weekends seeking “me time” and stay-at-home moms who waste their days away with Facebook, Pinterest, TV and books. Don’t be that mom. You’ll have the whole rest of your life to fritter your days away on electronics but your kids will only be young once. My children are both happier and more well-adjusted when I stay home. And while staying home is not a magic attitude cure, the rules and routines are now much more consistent. And it shows. My quiet child is more cheerful and personable. My wild-one is calmer and more reasonable. The attitude difference in our children is actually the #1 reason that my husband and I decided to make a few financial sacrifices in order for me to be able to stay home full-time with them. If you and your family are really happy with your current situation, great! But if you’ve been reconsidering your financial and job situation, pray over it. Consult your husband. Talk to friends who have been there. Seek input from your children. Make careful, informed decisions but don’t be afraid to make a change. Your family will benefit greatly from your willingness to follow where God leads. What about you? 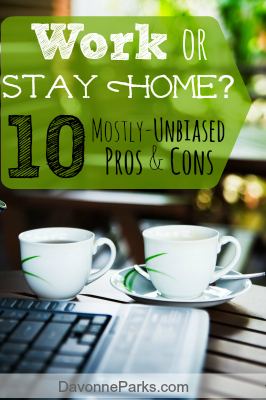 What (respectful) pros and cons do you see to staying home or working outside the home? Curious how you make money through ablog, or how to get started with this? Great question, Heidi! I highly recommend “How to Blog For Profit Without Selling Your Soul” by Ruth Soukup. That book is a wealth of incredible information and well worth every penny!